What makes Call-IT a specialist in the field of ‘customer contact’? On the one hand our people. 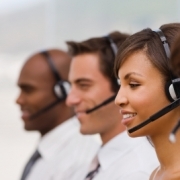 No “telephonists”, but specially selected and trained employees, who can empathize entirely with the culture of the client. The direct contact with the consumers and companies has become a specialism as it is and requires a lot of know-how and experience. Questions and problems of customers get more and more varied and complex, and the same goes for the subjects about which one contacts us. The knowledge of our agents to answer all requests for support adequately has to anticipate that and demands a thorough preparation. Our infrastructure is completely organised for all modern media. We work according to intelligent, integrated working methods. And exclusively with professional, experienced, involved and intensively trained employees. So intensively, that they are actually part of your own personnel and are seen as such by the customer. If you want to know more about our services, please contact our salesteam!